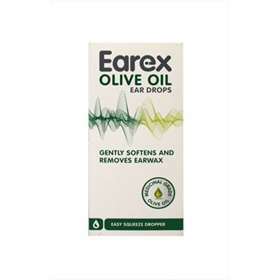 Earex Olive oil Drops is a natural lubricant which gently soften and helps remove earwax. Tilt the head to one side with affected facing facing upwards. Squeeze 2-3 drops of Earex olive oil into the ear, taking care not to touch the ear with the dropper or put the dropper into the ear canal, gently massage around the outside of the ear. Keeping the head tilted, allow a few minutes for the drops to reach the ear drum. Plug the ear lightly with cotton wool if required to prevent leakage. To remove, tilt the head so the ear is facing downwards and allow the oil to drain. Gently wipe the outside of the ear to remove the residue. Children under 5 years of age should receive medical diagnosis before using these drops and then follow the instructions given by the healthcare specialist. Read the enclosed leaflet carefully before using Earex olive oil Ear drops. Children under 5 years should receive medical diagnosis and supervision. Gently wipe dropper with clean cotton wool or tissue after use. Use within 28 days of opening. Do not use this product after the expiry date printed on the carton and bottle. Check that the dropper and bottle are not damaged or broken before use.